The Jolly-Pa-Looza Music Festival is coming to the Johnsburg Community Club on December 7th. Doors open at 5PM- Music from 6PM-1AM. Donation at teh door is $5. This years (2013) event will feature: LIVE music from Valentine, 4 Grand and Friction, Silent Auctions, Meat Raffles, Food & Beverages, Cash Bar and so much more!! Proceeds will go towards families touched by cancer. 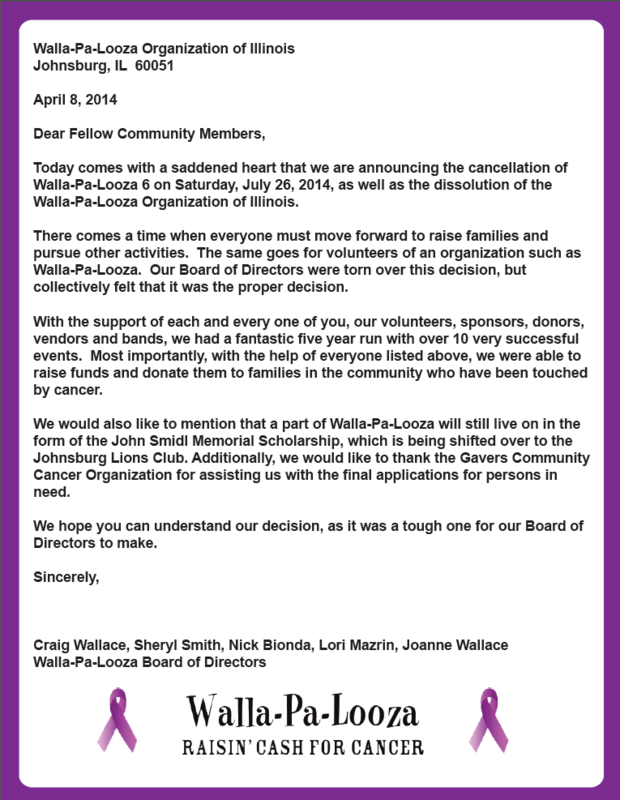 NOTE: On APRIL 8th 2014 the Walla-Pa-Looza Organization announced the dissolution of their organization, and will cease all future fundraisers. Walla-La-Palooza is an annual event that is held at the Johnsburg Community Club. Video shows highlights from July 28th, 2012. In the decades that the Johnsburg Community Club has been in existence- there have been many musical performances. This video was found on You Tube, and it is from a performance by the band Seam, whom performed on June 7th, 1997. Length: 34:47 min.